Updated June 2018; Originally posted May 2016. Adapted from the article “Blue Prune Drop and Leaf Scorch” by Bill Krueger UCCE Farm Advisor-Emeritus, Glenn County and Richard Buchner UCCE Farm Advisor, Tehama County in the July 2013 Sacramento Valley Prune News. Blue prune and, in some cases, associated leaf scorch often develops following the rapid onset of high temperatures (Figure 1). Damaged prunes color prematurely turn blue and usually drop from the tree. The more sun exposed fruits on the top or south side of the tree are most affected. Often the sun exposed side of the fruit will be sunken or flattened. Leaf scorch and dieback may develop in leaves and twigs near the damaged fruit. When damaged leaves dry, the veins may be a darker brown than the rest of the leaf. Figure 1. Blue prune and leaf scorch symptoms showing damaged fruit, scorched leaves and darkened leaf veins. Blue prune is associated with heat stress. Excessive heat results in damage to the fruit that is thought to produce a toxin which is transported to spurs, leaves and shoots resulting in the leaf scorch symptoms. Leaf scorch symptoms are always associated with damaged prunes. They do not occur in areas of the tree with no fruit or on young trees without a crop. Irrigation – Fruit drop and particularly scorch are generally more severe on shallow soils with limited water holding capacity or in orchards toward the end of their irrigation cycle at the onset of heat. Adequate soil moisture insures maximum evapotranspiration and cooling of the plant. Tree Position or Fruit Location – Leaf scorch is usually worse on border trees or on the south side of individual trees with greater sun exposure. Ground cover – Blue prune appears to be less severe in orchards with ground cover than in clean tilled or drip irrigated orchards. Transpiration from an adequately irrigated ground cover contributes to orchard cooling. In addition, a vegetated orchard floor reflects less sunlight than dead vegetation or bare ground. 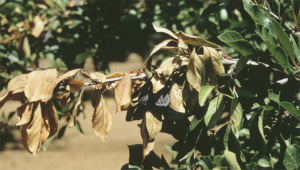 Nutrition – While blue prune and leaf scorch does not appear to be directly related to potassium deficiency, anything adversely affecting tree health and condition could contribute to higher fruit temperatures. Adequate tree nitrogen levels promote vegetative growth that shades fruit from direct sunlight. We don’t have any sure ways of preventing blue prune and the associated leaf scorch. However, you can reduce the risk by making sure trees are healthy, vigorous and well supplied with water. Because the damage is caused by heat and not a disease, it should not continue to expand in the tree. However, damaged wood can be an entry point for other pathogens like Cytospora or wood rotters. Consequently, damaged wood should be pruned out along with any other deadwood in the tree.